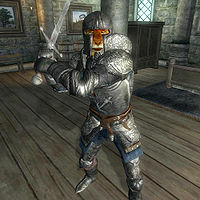 Ri'Zakar is a Khajiit warrior, and the "Pakseech", or head of Blackwood Company in Leyawiin. A formidable warrior who has traveled to all corners of Tamriel, he uses the Hist Sap to transform his mercenaries into lethal berserkers. He and his lieutenants are a great threat to the Fighters Guild. You will have to kill him during the final quest for the Fighters Guild. He will spend all of his time wandering around the Blackwood Company Hall. He is equipped with a full set of Blackwood armor and is armed with an enchanted blunt weapon and an enchanted claymore or longsword. He also has some spare clothes, a red velvet blouse with a matching garment. He carries the basement key and a small amount of gold. Speaking to Ri'Zakar will have him state his name, his position in the Blackwood Company, and provide a bit of information about the Company: "I am Ri'zakar, Pakseech of the Blackwood Company. The Company provides expert jihatt for selected customers. Very discreet." Asking him about jihatt will have him explain the meaning of the word; "Beg pardon. It is a word from the Ta'agra, meaning 'warrior for hire'. In Ta'agra, the word is vaguely disreputable. Such a fighter fights for gold rather than for clan or Mane. Of course, the Blackwood Company is mercenary in the Western sense... a reliable, professional contractor for military services." Asking him what a Pakseech is will have him explain the meaning of this word; "Excuse me. In the Imperial tongue, it means, roughly, 'clan chair' -- the seat of the clan patriarch. In the Company, we use the term to mean 'leader' -- but it carries the sense of wise father, concerned for the welfare of the whole family." Asking him about Leyawiin will have him reply; "The Blackwood Company is proud of our beastfolk heritage, and we are solely owned and operated by Khajiit and Argonians. We speak West-fashion for the comfort of our Western clients, but we invest the fierce pride of our ancient races in each of our mercenary contracts."